Chances are - no matter how long you have collected Omega vintage watches - you haven’t stumbled across this neo-vintage masterpiece. Produced in 1995, the straight lugged Omega Constellation Skeleton above was one of only twenty pieces produced in white gold. Two other editions with this modified Manhattan case style were released in batches of twenty pieces in yellow gold and pink gold. A further fifty pieces in the up-dated Manhattan integrated bracelet case were produced in eighteen karat solid gold. In all, only one hundred and ten skeleton Constellations were produced. The Skeleton collection accompanied another limited-edition series, the Manhattan Observatory Collection of fifty numbered pieces featuring a solid gold dial with a cloisonné observatory centre disc. 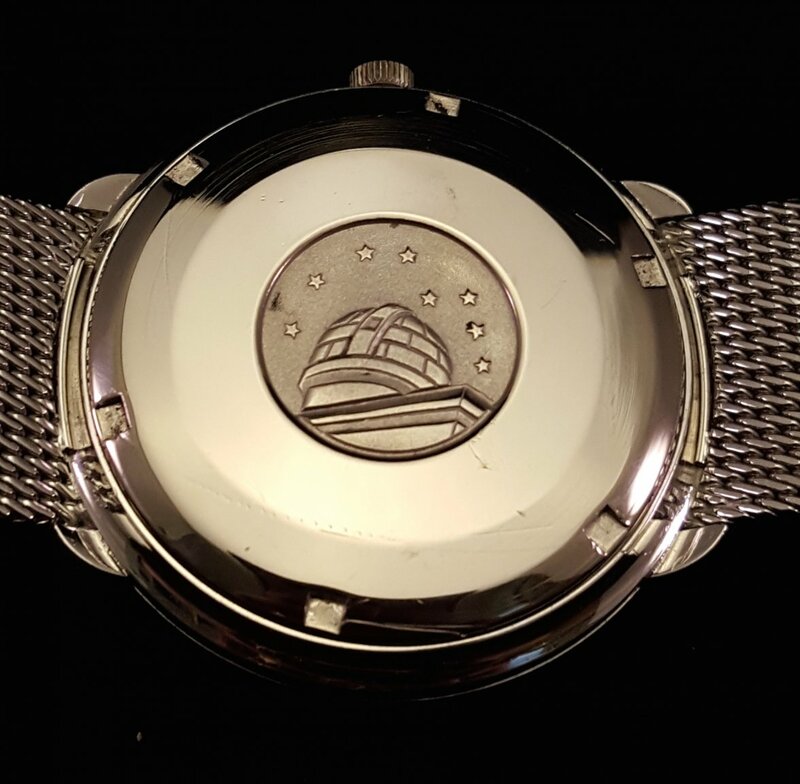 Both collections were created for the launch of the Constellation Manhattan face-lift, and first appeared at the prestigious Watches and Jewellery exhibition in New York in 1995. The Constellation Skeleton movement is a variation of the Omega automatic chronometer 2120, which was based on the Horological Hall-of-Fame ETA calibre 2892-A2. Designated as a calibre 2125 because of its superb craftmanship, the movement was skeletonised entirely by hand to achieve lightness and elegance without compromising its robustness and precision. Each piece was cut out, filed, bevelled and engraved by an individual master watchmaker at Omega’s revitalised in-house Atelier created to continue the tradition of decorative arts in watchmaking. The limited-edition skeleton and cloisonné Constellations were offered to high-end collectors and prestige watch boutiques and were snapped up quickly. Several have changed hands privately, but I cannot recall having seen one surface at a public auction. They belong in the rarefied sphere of serious collecting because of their exquisite rendering and their very limited numbers. 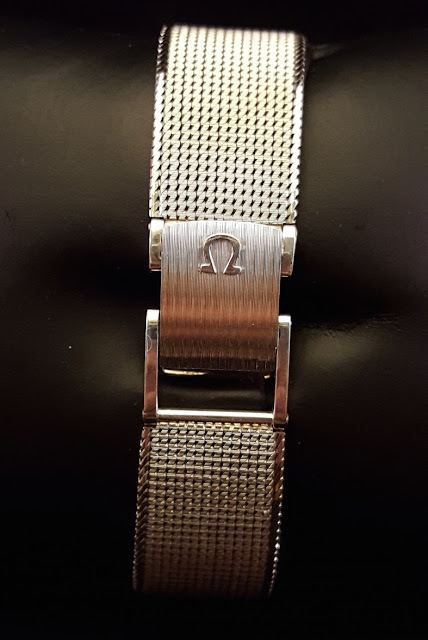 In the Nineteen-Fifties and Sixties, most Omega Constellations were marketed through jewellery and specialty outlets, and so when one encounters a bespoke, solid white gold Constellation that was made especially for the first ever dedicated Omega boutique, one’s pulse can be expected to quicken a tad. Seen below is one of the rarest Omega Constellations ever made, so rare that I have only ever clasped my eyes on one similar, but not exact, example. At 35 millimetres in diameter, this almost-pristine ‘montre bijoux’ piece was delivered in 1969 to Omega’s official Swiss distributor, Gameo, at a time when there was a growing interest in dress watches. While the style of lugs has rarely been connected to cases that housed 56x calibres, the design is very similar to the dress model 163.0001 powered by the ultra-thin calibre 712. 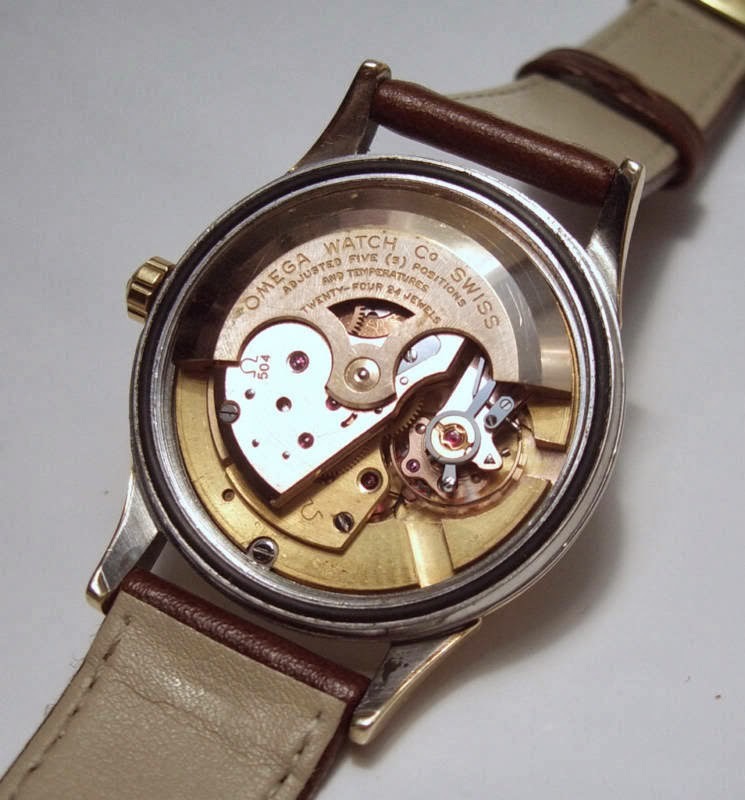 The Omega Museum identifies this model with the reference number 368.4098 - the 3 prefix indicating watch head and bracelet were together from conception – and it has a calibre 564 under the dial. It took the museum’s Charles Bernhard some time to pour through its Swiss distribution records originally maintained by Gameo to connect the number 7190 appearing on the inner case back with the reference number and indeed the history behind the watch. Four digit case numbers were exclusive jewellery designs normally reserved for high-end outlets that had enough clout to procure examples that were outside Omega’s normal range. Gameo was the national Omega distributor in Switzerland. It's owner, Charles Bauty, is credited with opening the first single brand boutique in the world in 1964, selling only Omega watches. His first Omega boutique was established in Geneva under the brand "Les Ambassadeurs", named after the Café Les Ambassadeurs on the Rue du Rhone that he purchased and converted. It's still there. He later established an exceptional boutique in Zurich in 1971. So, given it’s delivery date, I believe this watch was retailed through Les Ambassadeurs in Geneva. Any first issue 30.10 JUB Centenary model 2500 is uncommon because only 4000 pieces were produced. Factor in natural attrition through loss, wear, scrapping for gold value and the occasional ingestion by animals and you have a supply and demand equation that has seen the value of JUB Centenary watches increase substantially over the last decade. A fully French-cased 30.10 Centenary JUB, however, merits a description beyond that of “uncommon” and demands we venture into “R” word territory. The word “rare” as it applies to watches is flung around with such intemperance that even Donald Trump’s verbal ejaculations appear as models of semantic rectitude in comparison. This is why seasoned collectors, or even lightly seasoned collectors, immediately become sceptical when the word “rare” leaps from someone’s lips or keyboard. But “rare’ is the only description possible when applied to this French cased version. Many thousands of the calibre 333 Centenary were produced, but, as mentioned, only four thousand of the Jubilee version left the Omega factory in 1948. More than a third were exported to the USA, whereas in war-torn Europe - where economies had been devastated by the Nazi onslaught and subsequent allied invasion - money for luxury goods was not plentiful. Formerly large watch markets such as Italy, Britain, Germany and France had shrunk significanty. These markets didn’t collapse altogether, because of the willingness of occupation forces to spread around their discretionary income as well as much of their genetic material. The case was manufactured in France owing to post-war gold restrictions, and, given the state of the French economy in 1948, I doubt whether more than 100 pieces of this model were produced. This is only the third example I have seen in thirty years of collecting. Omega, France delivered this model to Hermes in Paris who may well have been the sole distributor for the model in France. The stamp of the luxury goods house appears on the external case back. 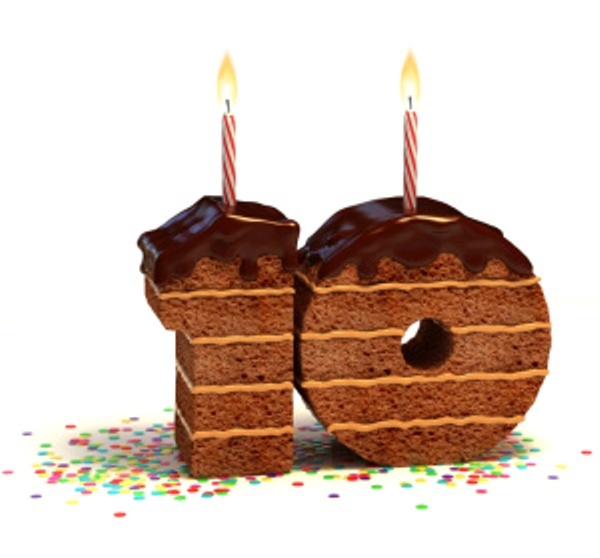 I launched this blog on June 28th, 2006. At the time, eBay and other on-line markets were, largely, an unregulated frontier more closely resembling a mercantile variant of Dodge City, circa 1870, than a fair and dependable marketplace. Cowboys, bushwhackers and outlaws roamed the fertile plains of on-line auction sites; Oriental crime gangs offloaded wagon loads of fakes with impunity; Frankenmeisters saw many opportunities to make a quick buck with their despicable horological confections, and buyer, and indeed seller, protection were pretty well non-existent. Ten years ago all of the major Omega-related chat fora were run by horological petrol-heads for the most part funding set-ups and ongoing operations themselves, or through member contributions and a trickle of advertising revenue. It was on these fora where we learned from each other and contributed our knowledge. By 2006, the “Buyer Beware” mantra had almost reached hysterical proportions on some watch fora. I felt that a certain hubris and heartlessness had entered collecting cultures, placing, in my opinion, a bit too much of the blame on those who had been duped and too little of the blame on the parasites and cockroaches who did the duping. And so I was motivated to set up a resource that in the case of Omega Constellations would perhaps help redress the imbalance a little. Another strong motive was to share with others my enthusiasm for Omega Constellations of the Fifties and Sixties, a collection of superb timepieces that time and the ill fortune of the brand in the Seventies had left undervalued and underappreciated. Quite a few of my earliest posts involved naming and shaming some of the more outrageous attempts to separate unsuspecting watch buyers from their money, however I tired of that soon enough. I decided that the best way to achieve both of the above ends was to present well-researched and detailed essays about various aspects of vintage Constellation and other Omega collections so as to help people value and appreciate the brand and acquire the knowledge required to make a judicious acquisition. Until 2013, I travelled extensively on business, spending up to twenty weeks a year in hotel rooms in various cities in Australia and around the world. 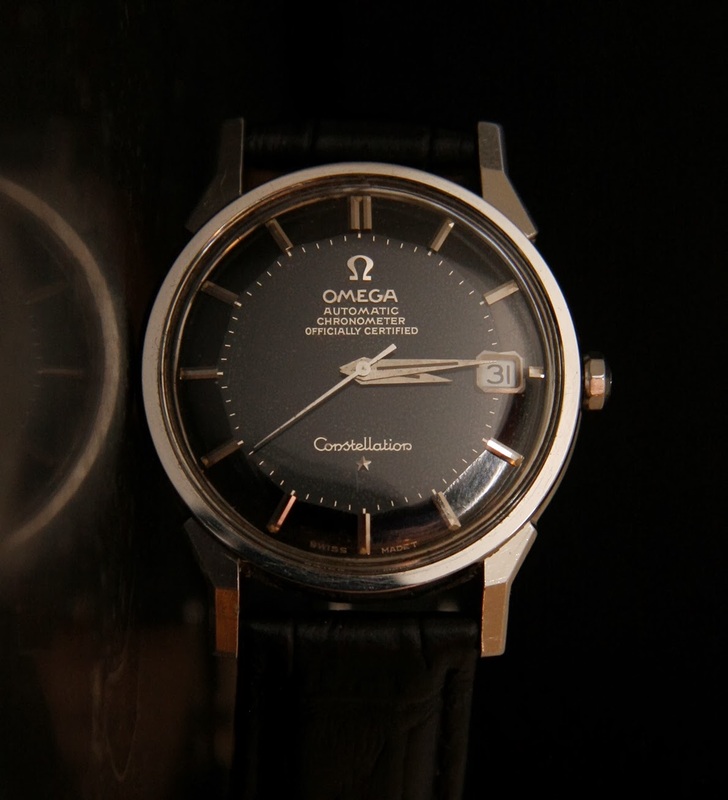 In the evenings, instead of watching hours of brain-numbing trash on cable TV or viewing breathless reports about nothing important on CNN and BBC News, I decided to use my time productively and write about various aspects of my favourite vintage brand, the fruits of which grew over time into the most comprehensive resource about Omega Constellation on the Web. At the time of writing, this blog has attracted a total of 2,175,905 visitors who have downloaded essays on Omega Constellation and other topics hundreds of thousands of times. Hopefully this resource has increased awareness and helped re-establish the reputation of Omega Constellation watches of the 1950s and 60s to where it was during the halcyon decades, that of the premier production watch brand of its time. Original watch catalogues are very useful in identifying and discovering information about particular lines of vintage watches, especially when accompanied with price lists of the time. They are a collectible in their own right and add to the richness and enjoyment of serious collecting. So when Jim Wilson acquired a 1955 Norman Morris Omega catalogue showing the entire men’s and women’s collections for the year, I quietly salivated over the prospect of having a peek. There are a number of interesting inclusions in the catalogue: an example of the hooded lugged Ultima with a beautifully woven and heavy Milanese bracelet; the appearance of black dialled Omegas confirming that they were part of the available inventory or not just special order; a Constellation being marketed as a Globemaster; a MK Two version of the Centenary 2499 available seven years after the original models to mark Omega’s 100th birthday, amongst others. The catalogue was originally held by Coffman Jewellers in Gettysburg Pennsylvania, an Omega stockist of the time. Our thanks to Jim for converting the catalogue into a digital format and for his generosity in allowing me to share it here. 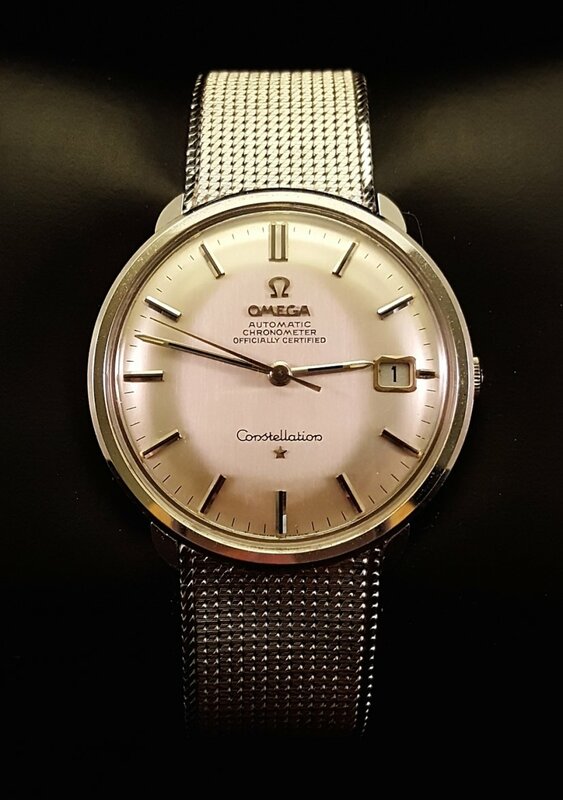 For some particularly strange and inexplicable reason, given that Oriental wrists are noticeably smaller than their European counterparts, Omega released a series of “Jumbo” Constellation watches in the Far East in the late nineteen-fifties and early nineteen-sixties (see post below and here). These 37mm diameter cases contained a spacer in which to embrace the 28mm automatic chronometer movements powering various models. 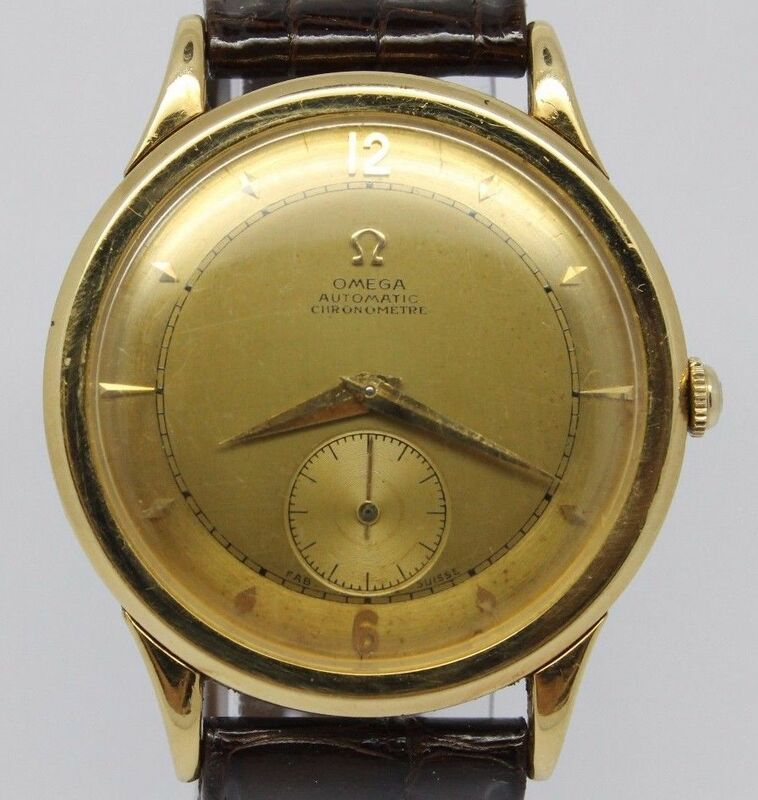 We know that at least three Jumbo collections were produced, mainly for the Japanese market which was a significant supporter of the Omega brand. Case 168.001 was preceded by case 14777 and recently a Constellation collector jolted my memory that I had seen the Grandfather of them all, the 14395, some years back on eBay. Washing around in the recesses of my memory was the thought that the 14395 was powered by a calibre 561 movement, but not so! The screw-in case 14395 shown above and below, courtesy of Omega collector Tony who was motivated to trawl Japanese locations in search of a 14777, was recently unearthed. 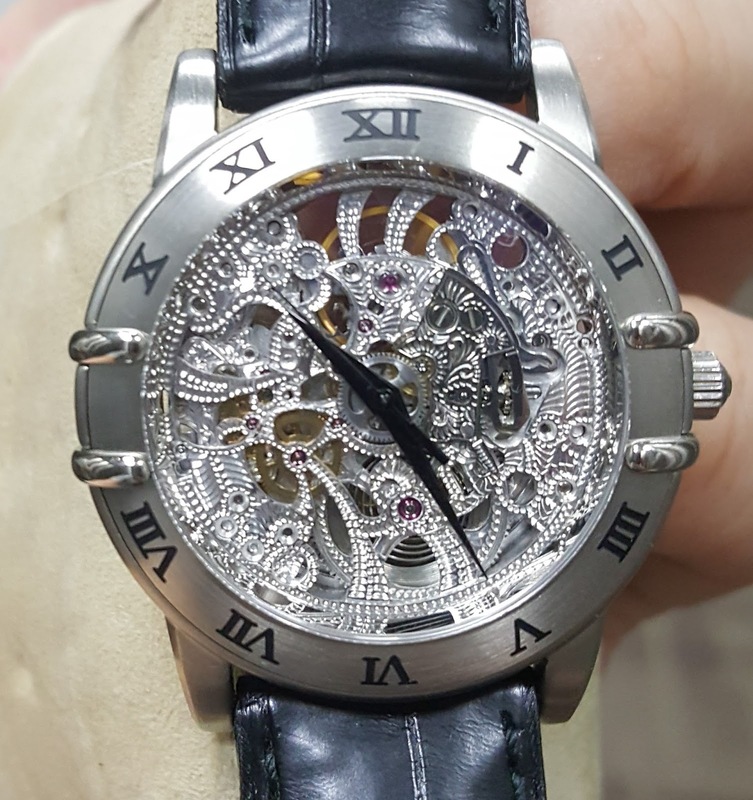 Tony initially thought the watch was indeed a 14777, until he opened the case back and received a very pleasant surprise: an almost pristine calibre 504 movement bearing a seventeen million serial number. So not only was Omega remaindering its inventory of calibre 504s in cases 14747 and 14397, but it's clear the company decided to experiment with larger cases in the Far East with a calibre 504 powered 14395. The dial, with what could only be described as having a very rare finish for a Constellation, contains the standard calibre 504 chronometer script. 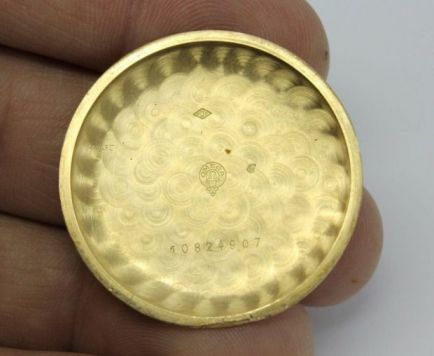 The case itself looks very much like a 14747 gold capped version, with a narrower tapering of the lugs at the case body. The model featured here is only the second example I recall having encountered. Given the circumstances of the acquittal of calibre 504 movements across various model numbers prior and during the launch of the calibre 561, it’s reasonable to conclude that calibre 504 powered Jumbos are quite rare. For those who enjoy the heady rush of the chase, the ‘Jumbo’ model 14777 Omega Constellation has the potential to have your adrenal glands a-gushing. Be prepared to endure the infusion of brain chemicals that feed and reflect frustration though, because finding one will not be easy. The calibre 561 model 14777, at 37mm diameter with 19mm lugs is the forerunner to the Jumbo 168.001, and like its successor was produced for mainly the Japanese market. The case shape is very similar to both the 168.001 and the 14393. In the Omega Far Eastern collection for two years, the earliest of these models was produced in 1961 and will have late 18 million and early 19 million serial numbers. The 1962 production models will bear serial numbers in the later 19 million range. The case back stamps will show 14777 61 SC and 14777 62 SC and carry the Central Boites tombstone maker’s stamp. 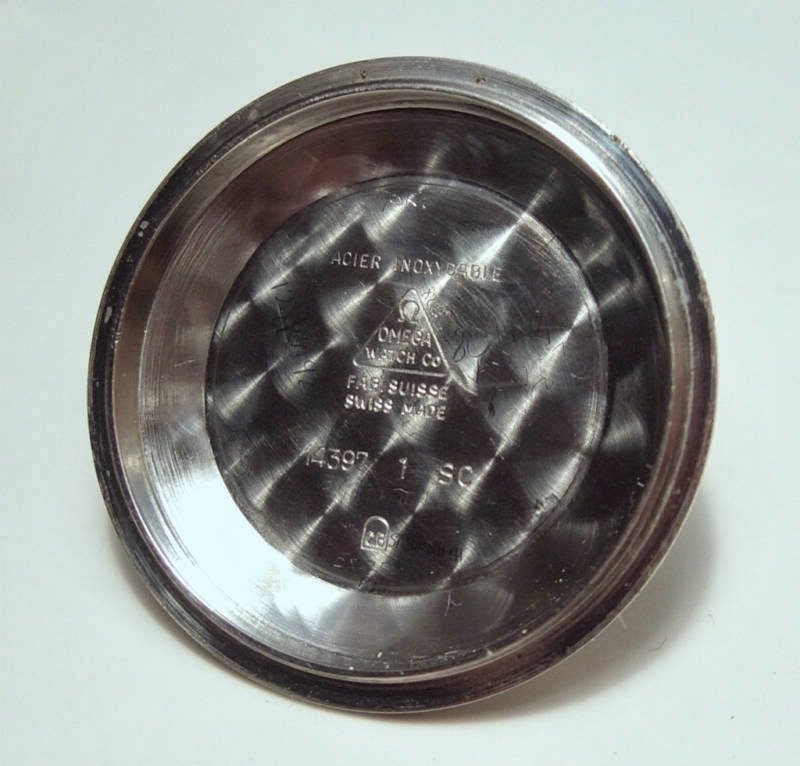 Dials were domed and offered plain and cross-hair versions. They were produced during Omega's short-lived experiment with the elimination of "Officially Certified" from the upper case script. While I wouldn’t rule out the cases having been produced in solid gold, the six examples I have seen over the span of my collecting experience have been either stainless steel or 200 micron gold capped. I have spotted a couple of examples over time with Beads of Rice bracelets attached to 19mm end pieces. While Japan and surrounds is perhaps not as tropical and humid as some South-East Asian countries, do expect to see more examples showing signs of dial degradation than in pristine condition. The two 14777s shown were both located in Japan, which is the best source for inventory, although they have migrated and been offered for sale in Korea and the U.S.
Are these models rare? I’d start with uncommon, and move onwards from there. Few surface, and examples in immaculate condition are very hard to find. If you didn’t realise its origins, a word coined by writer Norman Mailer in his 1973 autobiography of Marilyn Monroe could be mistaken as purpose-designed for the internet. He defined a ‘factoid’ as a “fact which has no existence before appearing in a magazine or newspaper”. Through repetition, these so-called ‘facts’ enter into public consciousness to become part of urban mythology and are very difficult to dislodge. 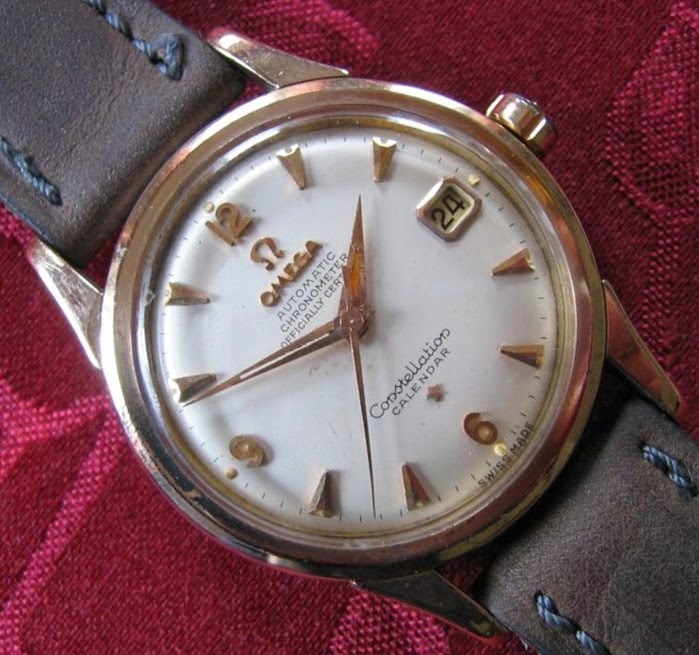 There are countless factoids pertaining to vintage Omega watches circulating on the worldwide web, devoured and regurgitated many times by people who, conceivably, are not gormless or naive, but never-the-less have taken the speculations and falsehoods of others on the Internet as the Rock of Truth. “The SHOM Seamaster was so named because Omega created this model for France's Service Hydrographique et Océanographique de la Marine (SHOM), a public agency that is charged with documenting and studying the oceans as well as supporting mariners through the publication of charts, maps, guides and almanacs. Apparently, SHOM's workers needed a sturdy, waterproof timepiece to reference as they charted, mapped and almanacked". The ‘SHOM factoid’, that of SHOM seeking a bespoke watch to fulfil its needs and commissioning Omega to design and manufacture it, is now part of horological folklore. Like many urban myths it contains a grain of truth, albeit a microscopic one as we will discover. A number of Swiss Watch companies touted their dive and tool watch collections to military procurement establishments around the world and often offered substantial discounts in their tenders to sweeten a choice in their favour. The marketing potential and resulting kudos of having a product selected by the military more than compensated for such discounts. Omega was an old hand at tendering for military contracts and was well-known for its collaborations with marine agencies since the early days of the Seamaster 300. 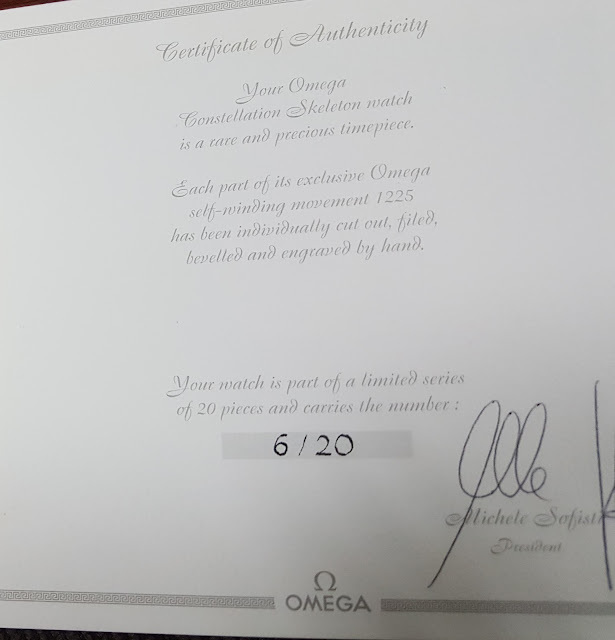 When the French Navy signalled that it was looking for an ‘official’ dive watch for its frogmen (pardon the pun), Omega was probably well up in the queue to have the Seamaster 200 evaluated by SHOM as part of its tender. It won the tender, and in 1979 began supplying the 166.177 to France’s "Marine Nationale" (meaning Navy) well in to the life span of the model, as mentioned. 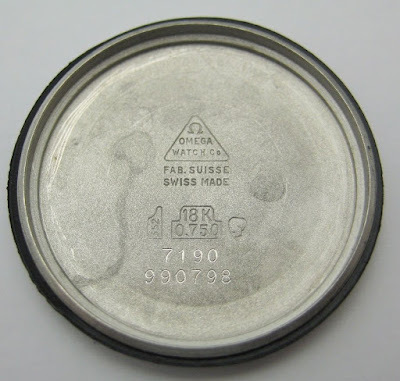 Normally the 166.177 case back will show the stamp ‘Tested to 200 metres’, however some pieces will have the engraving ‘MN 79’ on the case back, indicating their production after the appointment by the French Navy. This does not signify that such watches were ever in the service of the French Navy, but simply commemorates their adoption. Other official markings would need to be present before a 166.177 could be authenticated as a genuine military watch. Furthermore, it would be rare indeed to encounter an authenticated French Navy example because these watches were in service and part of the Navy’s inventory. They wouldn’t have had an easy life, and if any survived one would assume they would look far from the many pristine or well-kept examples we see on the worldwide web. 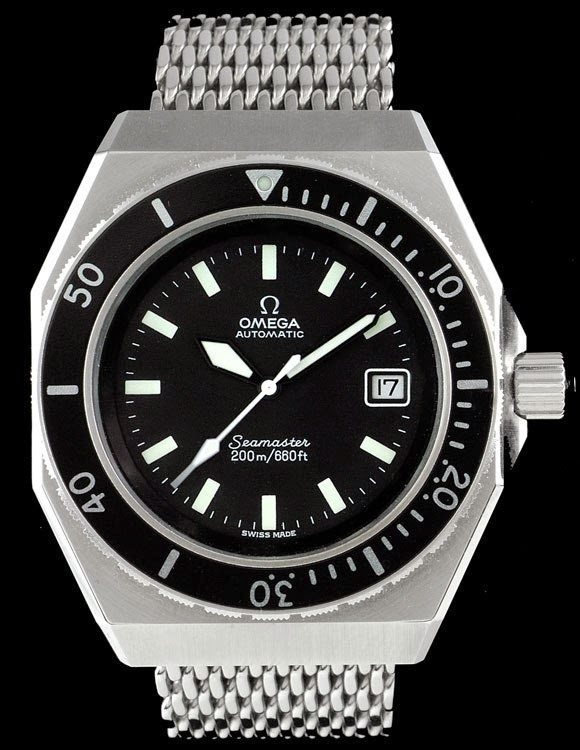 To repeat, there is no such animal as a Seamaster 200 SHOM. It is the product of the fuddled imagination of someone who attempted to make a loaf of truth out of a grain of fact. 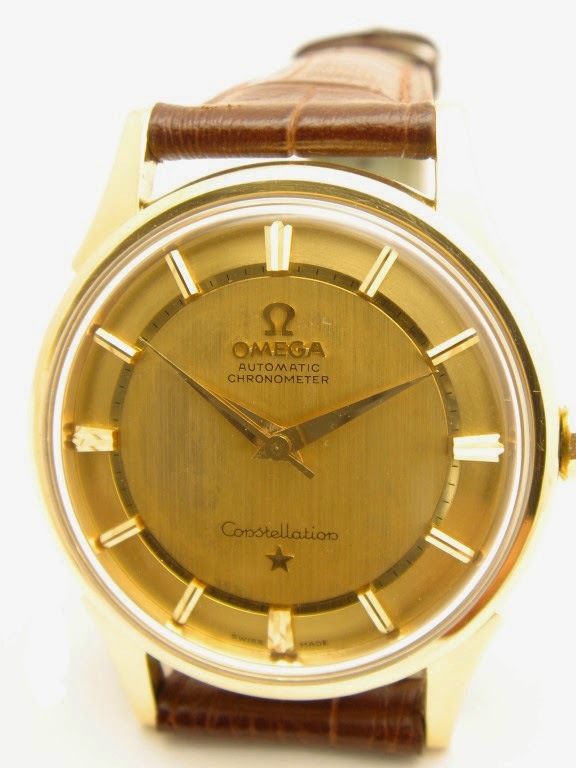 About eight years ago I compiled a database of all Omega Constellation models produced during the vintage era and included a range of more contemporary models up to 2003. 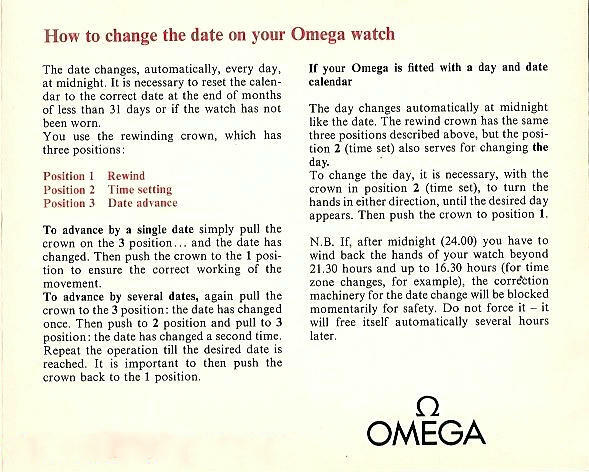 Over the years I added numerous Constellation models that did not appear in the Omega Vintage Database to the extent that they now now represent around 15 percent of the total. The database I compiled is an evolving document, and as new finds are made so the list grows. Several document 'snatching' services on the WWW have taken it upon themselves to expropriate my work without my permission - one even going to the trouble of removing the copyright notice - and there are few earlier versions of the document floating around in cyberspace. 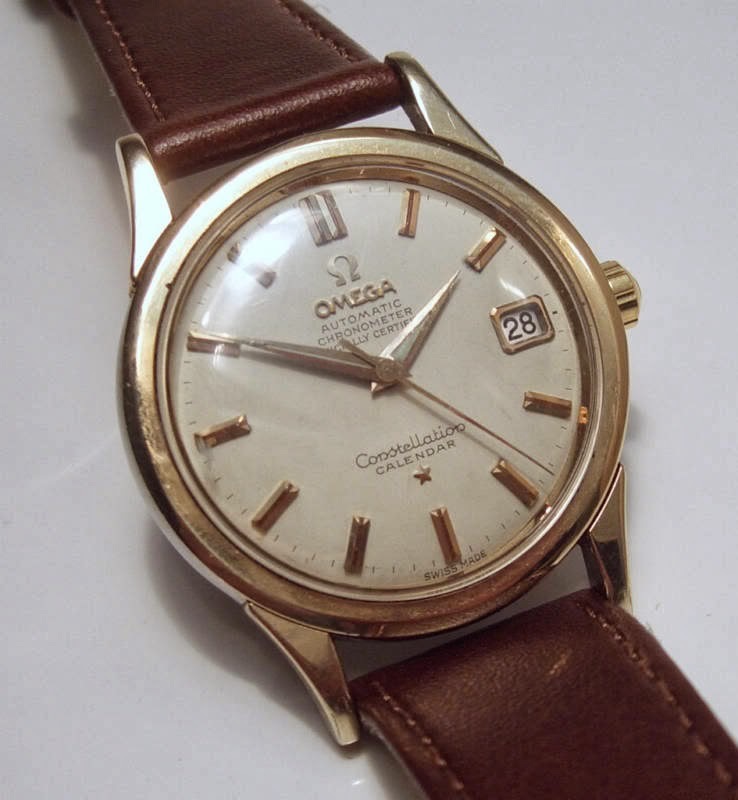 If you see an Omega Constellation model 14747 in the wild, stalk and run it down because you'll be one of the few people ever to hold this rare species in captivity. If you find two, consider a breeding program! If one happens to be clinging to the wrist of its custodian please use means of persuasion other than homicide to facilitate the separation process - the offering of money suggests itself as a better alternative. I first stumbled over a pink gold-capped version of the 14747 in the mid-2000s (see picture above). 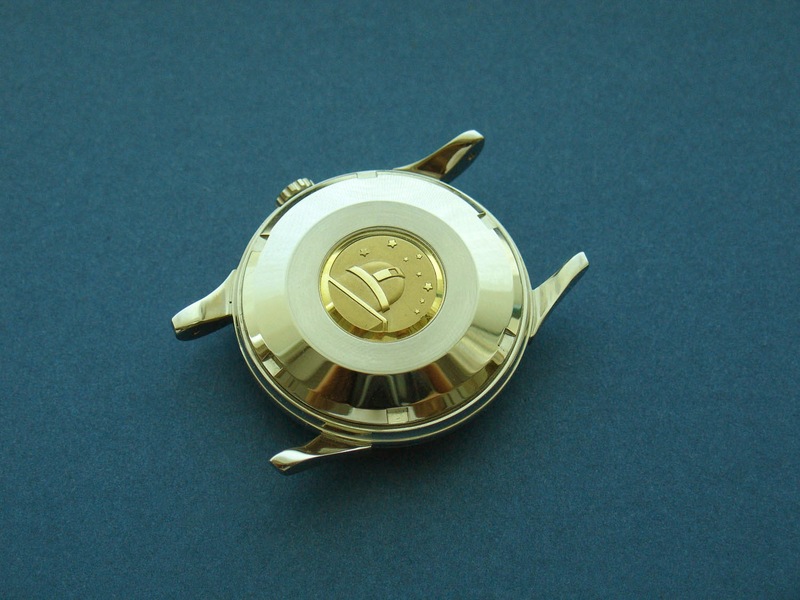 Later, I encountered a stainless steel version with pink gold dial furniture and medallion in June 2008. Since then, I have seen a total of three further examples, two of which were in stainless steel. As the comparatively rare model 2887 is the screw-in case back version of the calibre 505 model 2852, so the 14747 is the screw-in contemporary of the calibre 504 powered 2493. Unlike the 2887 which encases a 29mm dial, the 14747 takes the same dial as the 2943. I am told that the 14747 came in all metals, and while I have seen pink and yellow gold capped and stainless steel cases I am yet to catch sight of a solid gold version. 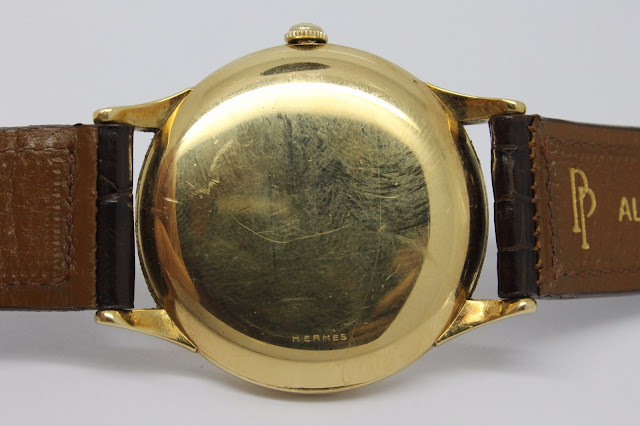 All non-solid-gold pieces feature a 14 karat gold medallion on the case back. Stainless steel models pick up the colour of the dial furniture. In the case of rhodium plated markers and hands, the medallion is yellow gold. Only 25,000 pieces of the calibre 504 were made, the vast majority of which appeared in the press-in case back model 2943. It is a testament to the rarity of the 14747 that this model seldom, if ever, finds its way into global internet or physical auction markets. Even a search using that one trick pony, Google, will reveal little of value amongst the standard commercial detritus polluting its pages. 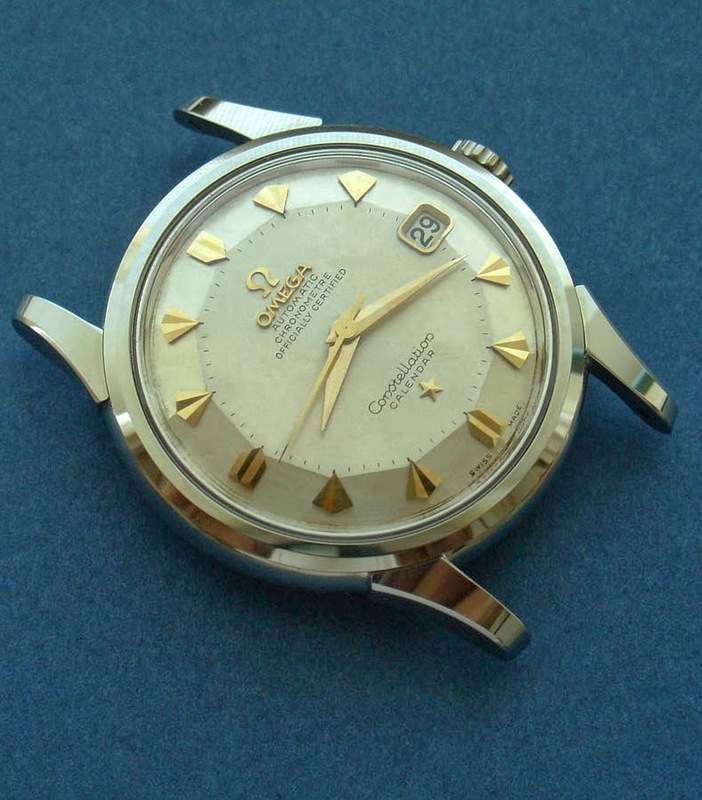 Omega archives indicate that the 14747 was the replacement for the 14397, and while the 14397 does not appear in the Omega vintage database either, it was powered by the calibre 504 and had a screw-in case back too. The 14397 pictured below is the first and only example I have seen. 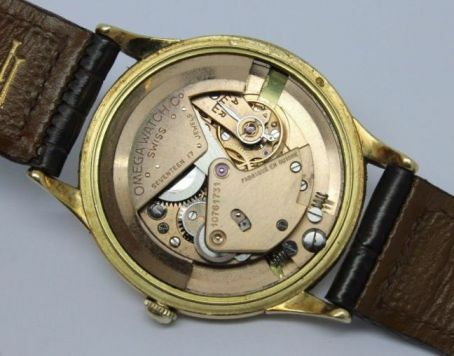 Interestingly, case parts (such as case backs and crystals) for the 14397 are interchangeable with case 14393 which housed the first calibre 561 model. A plausible explanation for the existence of the two calibre 504 screw-in versions may be that when the decision was made to move exclusively to screw-in cases with the new mid-500 series of calibres Omega designated the remaining calibre 504 inventory to be cased in the screw-in cases 14397, and soon after the 14747. Hence, it is perfectly acceptable to describe both the 14397 and 14747 as ‘rare’, and I’m hoping that word alone will trigger a wider search for these elusive pieces. They are out there. If you encounter one, please click the ‘About Me’ icon and send an email with pictures! If you want to know anything about British cased solid gold Omega Constellations of the nineteen-fifties and sixties, there is no point asking the Omega Museum because they have not kept comprehensive records. Instead, you are left with the option of trawling through the www and applying a sieve to hearsay, myth and fantasy in the hope of discovering some nuggets of fact. Well, that certainly was the case until British collector Andrew Romaine invested time and considerable labour in producing a comprehensive review of Omega's relationship with U.K. precious metals case maker, Dennison. Andrew deserves our sincere thanks for his continued efforts in filling this knowledge gap.